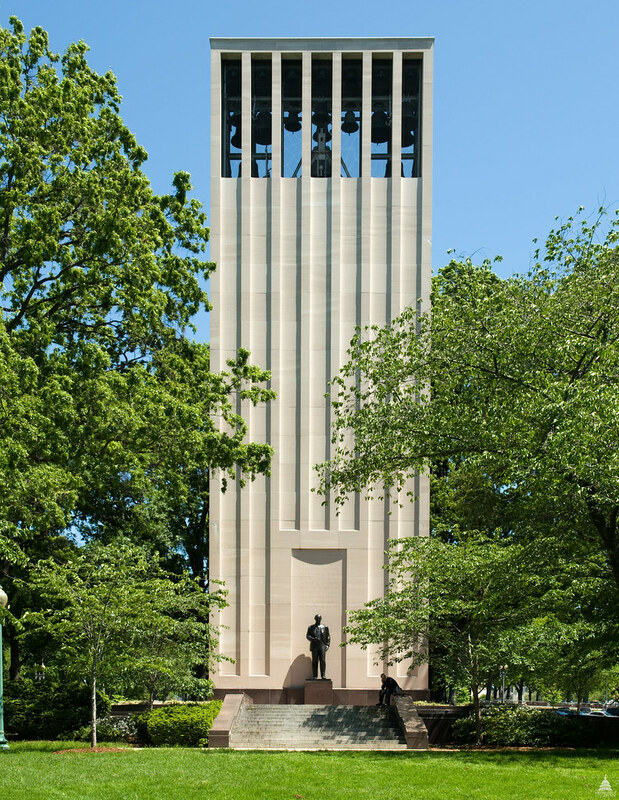 The Robert A. Taft Memorial and Carillon is located north of the U.S. Capitol, on Constitution Avenue between New Jersey Avenue and First Street, N.W. It honors Senator Taft from Ohio who served in the Senate from 1938-1953. The Robert A. Taft Memorial and Carillon is located north of the United States Capitol, on Constitution Avenue between New Jersey Avenue and First Street, N.W. Designed by architect Douglas W. Orr, the memorial consists of a Tennessee marble tower and a 10-foot bronze statue of Senator Taft sculpted by Wheeler Williams. The shaft of the tower measures 100 feet high, 11 feet deep, and 32 feet wide. Above the statue is inscribed, "This Memorial to Robert A. Taft, presented by the people to the Congress of the United States, stands as a tribute to the honesty, indomitable courage, and high principles of free government symbolized by his life." The base of the memorial measures 55 by 45 feet and stands approximately 15 feet high. Jets of water flow into a basin that rings the base. The 27 bells in the upper part of the tower are among the finest in the world and were cast in the Paccard Bell Foundry in Annecy, France. The largest, or bourdon bell, weighs 7 tons. The bells are well matched and produce rich, resonant tones. At the dedication ceremony on April 14, 1959, former President Herbert Hoover stated, "When these great bells ring out, it will be a summons to integrity and courage." The bells are automatically operated to strike the hour and sound on the quarter hour; they can also be played manually. Construction of the memorial was authorized by S. Con. Res. 44 (84th Congress, 1st session), which was passed by the Senate and the House of Representatives in July 1955. It was funded by popular subscription from every state in the nation. More than a million dollars was collected. Robert A. Taft was born on September 8, 1889, in Cincinnati, Ohio; his father, William Howard Taft, was the only person to serve as both President of the United States and Chief Justice of the Supreme Court. Robert Taft was elected to the Senate in 1938 and served until his death in New York on July 31, 1953. He was affectionately dubbed "Mr. Republican."